Based on customer input and talking to parking strategists, we’ve evaluated the traffic situation at the South of the James Market and are implementing adjustments to make arriving and departing safer and more pleasant. This is a work in progress so we appreciate your patience! 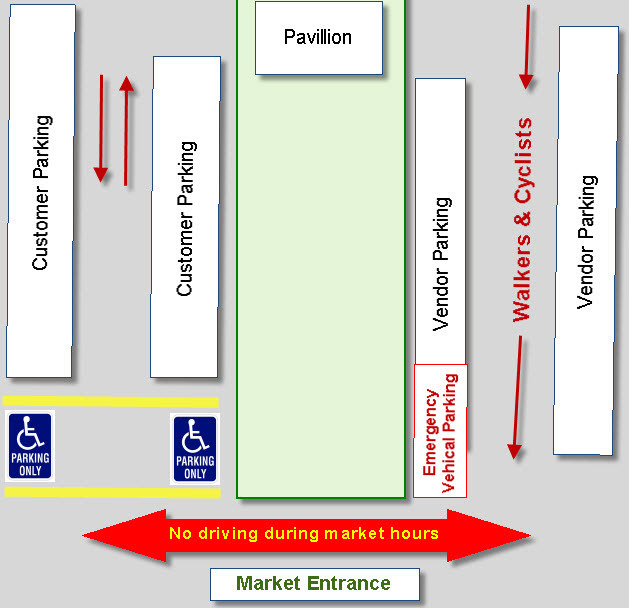 Starting this Saturday, we are closing the “loop” at the bottom of the parking area closest to the market. As you are coming into the parking area, the left side of the parking lot from the pavilion down to the market will be filled with vendors parked cars and closed to moving vehicles during market hours. That will make this area safer for walkers and cyclists making their way to and from the market. The parking area on the right of the pavilion as you are coming in will remain customer parking however you will exit by going out the same way you came in without going through the loop. We will reserve the last 10 spaces (5 on each side) for handicap parking. See the map below (it is not drawn to scale). Great idea JohnE. We’ll contact you.